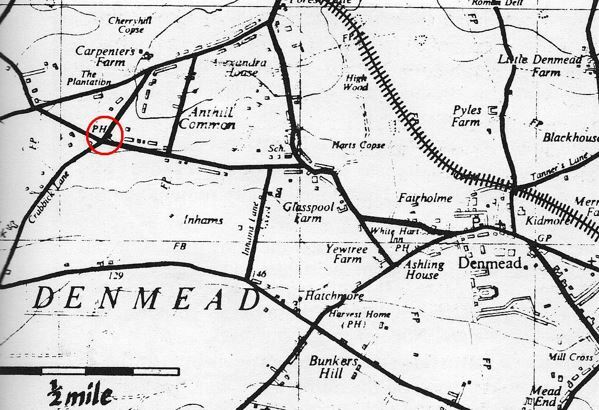 The area known today as Anthill Common was originally called Anthill Plain in the early 1800’s and was part of the Forest of Bere, which was a ‘royal’ forest and as such it was forbidden to build dwellings within it without permission of the King. Around 1840 the infamous Inclosure’s Acts (Enclosure’s in modern spelling) were introduced which allowed landowners to enclose land and charge rents for the use of such land. 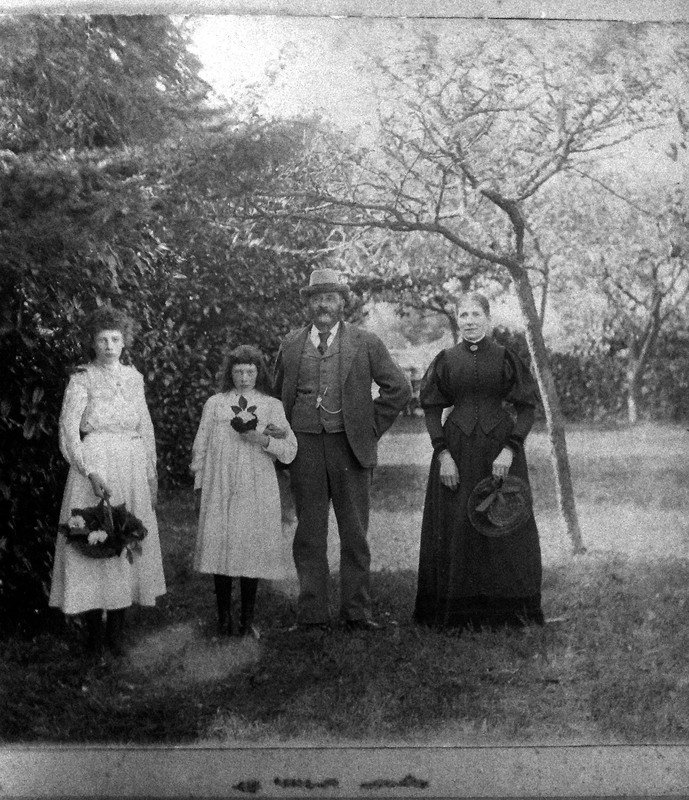 Those who could prove ‘Commoners Rights’ did have claim to small plots of land for their own personal use, which they had to purchase from the landowner, but proving those rights was difficult, particularly as most people could neither read nor write so didn’t know how to claim those rights. On 25th March 1878 Messrs’ Charles Burrell, Harry Burrell and Percy Wormald, (described as Common Brewers of Alton), bought 1 acre and 29 perches of land for £4-1s-32d off Daniel Lunn of the Inclosure (sic) Commissioners. This plot of land also included an already built Beer House (later to become “The Fox & Hounds), which was let to, and run by, a William Ellett (sic) at a ‘brewers rent’ of £12 per annum. The said brewers at that time owned the Crowley Brewery in Alton which was later sold to Watney, Combe, Reid & Co in 1902. As there was no development prior to 1870 and by 1878 the Fox & Hounds was an established beer house this suggests it may well have been built as such in the first place, probably to serve the local farming community and possibly by the Daniel Lunn. In the 1881 census a William Elliott is shown as an ‘Ale House Keeper’ living in an area simply described as ‘Anthill’ in the census. (See below) Also living at that location is a George Elliott, described as a ‘Boarder’ in the census so not necessarily related to William. By the 1901 census George is listed as an ‘Inn Keeper’, showing that the Fox & Hounds was now a fully licenced premises and presumably offering food as well as alcohol as that is the usual definition of an Inn at that time. Interestingly throughout all these censuses the Fox & Hounds was in the civil Parish of Hambledon, Denmead not achieving Parish status until 1932. 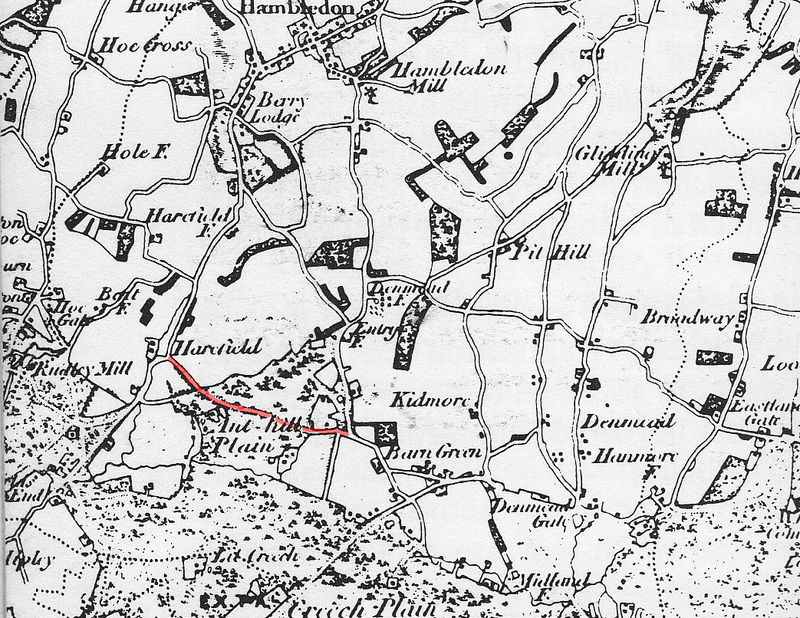 By 1890 there appears to be some development of the Anthill area, and the Fox & Hounds is marked on Ordinance Survey Maps of that time. 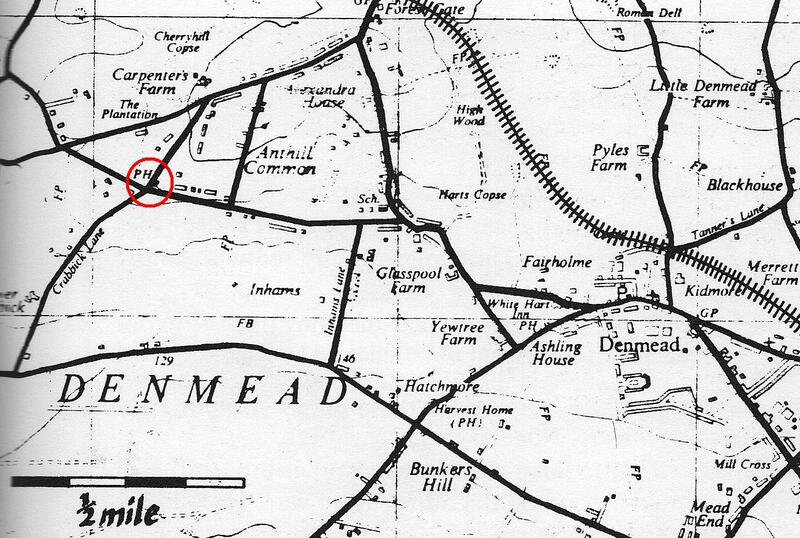 The map below is from 1895-6 (the Fox & Hounds is circled in red) when a railway line was proposed to link Havant with the Meon Valley at Droxford. As usual conflicting interests in Parliament saw that it never materialised. However most of the familiar names of the village are now in place and ‘The White Hart’ and ‘The Harvest Home’ are also marked upon the map. There is little history of the development of Anthill Common between the start of the 20th century and the late 1950’s. It would seem that most historians appear to favour the centre of the village rather than Anthill Common. A World War II history of the area relates that the ‘Fire Watchers ‘ would repair to Anthill Common using the higher ground to look out over the village at night, but it’s not known if they frequented the Fox & Hounds in the course of their ‘watching’, probably not as beer was scarce and weak during this period. It is known however that the Fox & Hounds passed into the ownership of Watney, Combe, Reid & Co in the early 20th Century; and in 1956 Crowley & Company Ltd (it was still trading under that name even though owned by Watneys) sold the property to a William and Christine Halcrow. At that time Crowley & Co also appeared to own The White Hart and the Travellers Rest, which some of today’s residents still remember as ‘Watney’ pubs with the dreaded ‘Red Barrel’ keg bitter! One note of interest is an extract from the History of Portsmouth Rugby Club which states: “After the end of the hostilities (World War II) Portsmouth was left with no ground, as Rat Lane had been taken over by the War Office, and found temporary accommodation at a pitch in Denmead with changing rooms being provided by the Fox and Hounds Public House”. This sounds a bit odd as the playing fields are down in the village and they would have had to travel some distance to use the Fox & Hounds as their changing rooms! However Bill Freemantle, who was living in Handel Cottage on Uplands Road during 1945, tells us that they actually played their games on the field in Thompson’s Lane, which is still there today. He used to go and watch them play there, but it didn’t encourage him to want to play the game, quite the reverse in fact he says. The Fox & Hounds during the war years – Note the absence of signs which was ordered during the war to avoid Germans using them as landmarks. Many older residents, and some from further afield, have fond memories of The Fox & Hounds from the 1970’s; when besides the pub it boasted two skittle alleys, a restaurant and a car park large enough to hold the coaches that brought groups out to pub for an evening of ‘Skittles’ with a ‘Chicken in the Basket’ meal (Sausage and Scampi were also available!). The Landlord in those days was a Mr Alfred Lush and he was one of the first publicans in the area to start doing what we now expect in every pub – bar food, even if it was restricted to chicken, scampi or sausage in a ‘basket’. It was also one of the few pubs in the area to boast a restaurant, but sadly it was probably ahead of its time in that respect as he struggled to make the restaurant pay and Skittle Evenings eventually waned in popularity. (It’s interesting to note that despite this decline the Landlord during the 1990’s complained that he still got phone calls from people enquiring about booking a Skittle Alley for an evening ‘do’! As he said “They must have been regular customers then!?”). 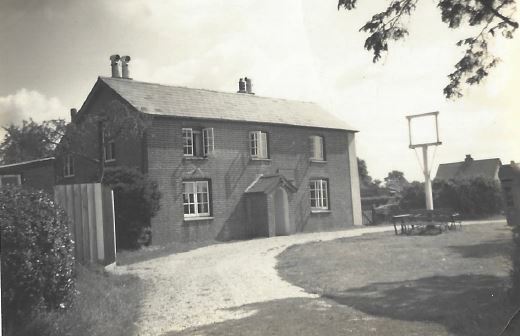 It was Mr Lush who extended the original pub premises to the size it is today by building a ‘Games Room’ and Kitchen area to the rear of the old building. Fox & Hounds extension which was to become a nightclub popular for miles around, but not with the local residents. In 1979 the restaurant was converted into a night club but strong opposition from local residents in what is essentially a quiet semi-rural area resulted in a dramatic court room battle at Droxford Licencing Sessions as reported in ‘The News’ of 4th March 1980. The result of this confrontation was that the music and dancing licence for the premises, (which allowed the night club to open until two in the morning Thursday, Friday and Saturday nights), was revoked, resulting in the closure of the said night club. Despite the threat of further legal action the night club never re-opened. 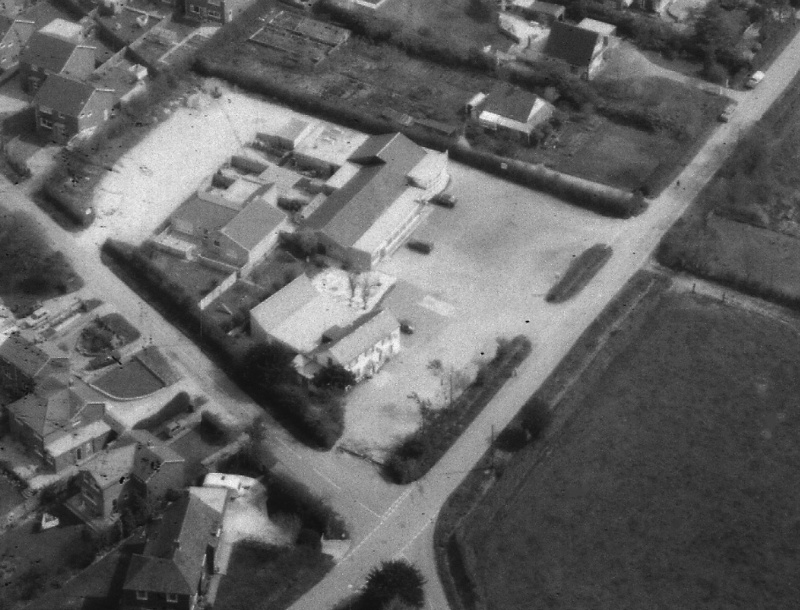 The aerial photograph below shows how extensive the site was circa 1980. The photograph clearly shows the long building housing the Skittle Alleys with the Restaurant at the far end and kitchens behind it. The bungalow built by the then owner, Mr Lush, is directly behind the pub, which by that time had the new ‘Games Room’ and Kitchen extension added. Various outbuildings and garages can also be seen in the rear parking area. As the photograph shows this was a large site, and between 1977 and 1988 there were various planning applications made for development. Some were for improving and extending the existing pub facilities and layout, but several were attempts to build houses on the site in addition to the bungalow that Mr Lush built around 1977. 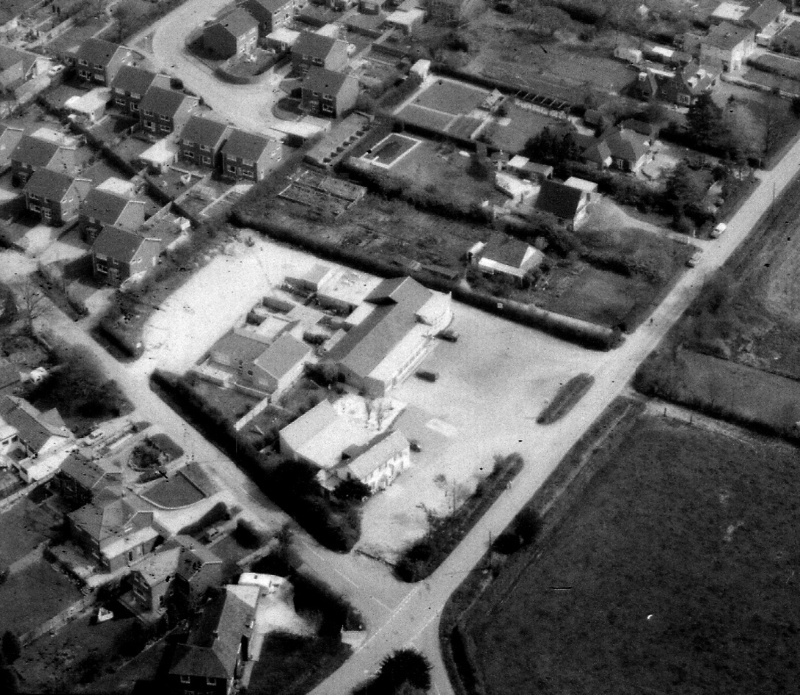 With the failure of the various ventures mentioned previously it was inevitable that applications to build houses would follow, and between 1986 and 1988 there were successful applications to build two houses on the School Lane frontage of the plot and two houses on the Upper Crabbick Lane frontage, resulting in the loss of the Skittle Alleys, Restaurant and the large car park. During this period Mr Lush also sold the pub business to Hartridge and Sons Limited whilst remaining for a time in the bungalow. By now the Fox & Hounds was reduced to the size of premises that we know today, and whilst in the ownership of Hartridge and Sons had a number of landlords. Some of whom were successful and some were not. Despite the fact that not all the landlords were successful the regulars still supported the pub and socially it was popular with both locals and visitors. At various times it supported a golf society and a cricket team and although neither was known for their sporting abilities they were however well known for their social activities after matches and events!